Dustin Moskovitz Is World's Youngest Billionaire, Not Mark Zuckerberg! Dustin Moskovitz Is World’s Youngest Billionaire, Not Mark Zuckerberg! Okay, so the world now has a new youngest billionaire. And the guy we are talking about here is Dustin Moskovitz who co-founded Facebook as the lead programmer along with Mark Zuckerberg and Eduardo Suaverin. Till this time it was Mark Zuckerberg - the youngest billionaire in the world but the soaring valuation of Facebook has brought two of its other co-founders into the ranks of the Forbes 400 billionaires. 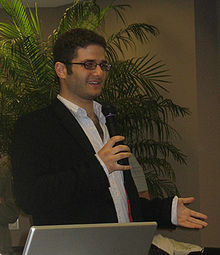 Dustin Moskovitz, who is now the world’s youngest billionaire is just 8 days younger than Mark Zuckerberg. Dustin's birthday listed on Wikipedia is May 22nd, 1984 and Mark's is May 14, 1984. He went on to become Facebook’s first CTO (chief technology officer) and then further, the Vice President of Engineering at Facebook. However he quit Facebook in 2008 to start his own venture called Asana, a firm that produces software helping companies to collaborate better. Here is a video of Dustin Moskovitz speaking at a keynote event.